I’m the kind of person who thrives on anticipation. I love nothing more than planning in a project at work, booking in my next holiday or organizing an event (don’t even get me started on the wedding . . .). But sometimes I look forward to the future with such a sense of excitement – whether it’s a weekend of activities or simply what I’m going to have for lunch that day – that I need to take a step back, to remind myself to live in the present and enjoy each moment as it comes. As mentioned in this previous post, summer is my favourite time of year. I love the warmth, the bright, sunny days and long light evenings. I’m a pretty happy person all year round, but in the summer that happiness bubbles over into something even more special: I feel completely content surrounded by the bounties of nature and what feels like a world of endless opportunity. Because of this endless sense of anticipation, even on the most beautiful summer’s day, sun beating down and surrounded by those I love best, a tiny part of me will be thinking of what happens next. I’ll be steeling myself for the arrival of autumn and the onset of rain, the times when fresh berries are no longer in season and I’ll have to survive on those stocked in my freezer, when frost settles in the morning and the world outside is cloaked in darkness before I even leave the office. But today I’ve decided to take a step back, to forget about the encroaching autumn or anything further ahead and to enjoy a simple dessert for what it is. Some people say that ice cream is a summer treat. There will be those of you that are already packing away your machines, saying goodbye to frozen desserts for another year and rolling out the jars of steel cut oats, brown sugar and bowls of autumn fruit to turn into cobblers, crumbles, pies and tarts. Others – me included – would argue that ice cream should be eaten all year round and is perfectly suitable to enjoy in the autumn. This ice cream is all about the moment. Eat it in summer and the gentle honey notes soothe against the heat, the creaminess cleansing your palate. Enjoy it in the winter with a warm desserts and it will melt into a mellow, comforting puddle of sweetness studded with crunch. Brighten it up with a squeeze of lemon, add in warmth with a sprinkle of cinnamon or eat it exactly as detailed below. This is an ice cream that adapts to its surroundings, to enjoy in the moment, spoonful by sweet spoonful. It’s also a recipe that builds with every bite. It might not be much to look at, but gives off a powerful aroma of honey, something you don’t often get from frozen food. Put it in your mouth and all else is forgotten as rich, smooth, honeyed cream melts around pockets of crunchy, chewy, honeyed nuts (which actually taste a bit like posh Sugar Puffs, in a totally amazing sort of way). Eat this ice cream and there’s no need to look forward to the future, simply because the present couldn’t get much more perfect. The recipe below will make more nuts than you need in the ice cream. But they’re completely irresistible and you’ll probably find you’ve eaten away exactly the right amount by the time it comes to stirring them in. Line a tray with a silicone baking mat or baking parchment. Very lightly grease with oil if using parchment. Heat the honey and salt in a frying pan. Once the honey starts to bubble, stir in the pistachios. Cook over a moderate heat, stirring frequently until the nuts are thickly coated in the sticky honey, about 3 minutes. Tip the coated nuts onto your prepared tray then stir as they cool, collecting any honey that collects beneath them and basting it back on top. Once cool, break the clumps of nuts apart, chop roughly and store in an airtight container until ready to use. Warm the milk, sugar and salt in a medium saucepan. Pour the cream and honey into a large bowl and set over an ice bath with a mesh sieve on top. In a separate medium bowl, whisk the egg yolks until pale and fluffy. Slowly pour the warm milk into the egg yolks, mixing constantly, then scrape the warmed egg yolk mixture back into your saucepan. Stir the mixture constantly over a medium heat using a flat wooden spatula until it thickens and coats the back of the spatula. Remove from the heat and pour through the mesh strainer into the cream. Whisk over the ice bath until cool. Chill the mixture in the fridge overnight then churn according to your manufacturer’s instructions. 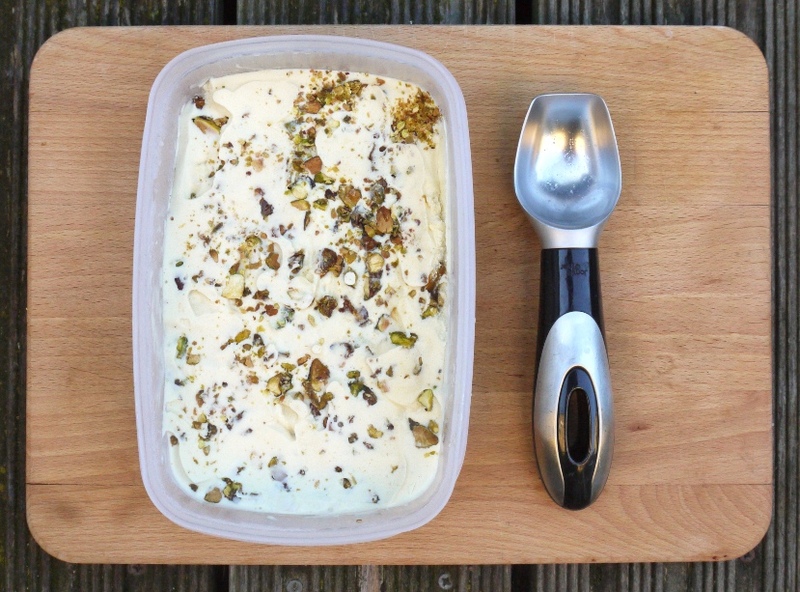 When churned, fold through about 100g chopped honeyed pistachios then freeze until ready to eat. Don’t get too down about autumn – I’ve learnt to appreciate all the seasons and now I don’t have a favourite :D. This ice cream sounds wonderful – such a great, classic combination. This looks amazing! I kind of just want to snack on those honeyed pistachios! I’m such a forward-looker, too. I so often am looking forward to the next thing that I forget to enjoy the current thing (which is something I was previously looking forward to). So I completely understand! I know I would adore those honeyed pistachios, they look irresistible. I am a summer lover too, already missing it terribly! !! My two favorite flavors are honey and pistachio. And my favorite food in the entire world may just be ice cream (maybe). I NEED to make this! So inspiring, this looks absolutely perfect. Frugal Feeding – now that autumn’s arriving I think I can cope with it, but I do still miss those hot summer days! 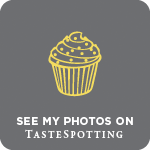 Lauren – you definitely do, they’re sooo good! Food, Photography & France – the nuts on their own are pretty crunchy, but once they’ve been in the ice cream a while they start to soften up. Erin – it sounds like we’re very similar in that respect! Amy – yey, so pleased you like it…enjoy! I absolutely adore psitachious. I have a terrible habit of sprinkling it everywhere. That is, until someone told me it could be a isgn I was pregnant :0 This ice cream has all my favorite ingredients including the honey! I´m glad you´re still making ice cream even though it´s getting colder. It´s such a treat. This is such a winning combination! A wonderful recipe, no wonder it´s from DL. For me there´s no such thing as putting the ice cream machine away! What a beautiful ice cream, and a heartfelt post – I know exactly what you mean about the skies getting dark before we even set out the door. 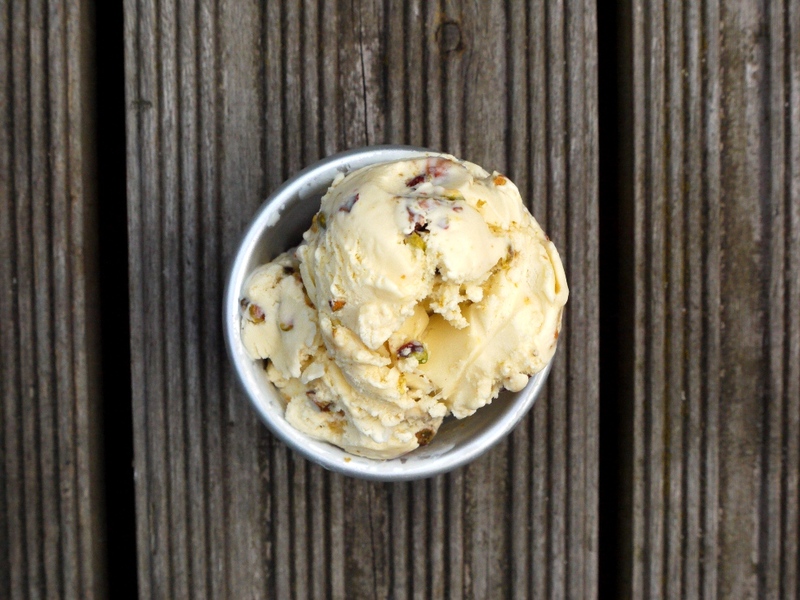 Am gearing up for it with lots of bakes and very possibly, this lovely ice cream. 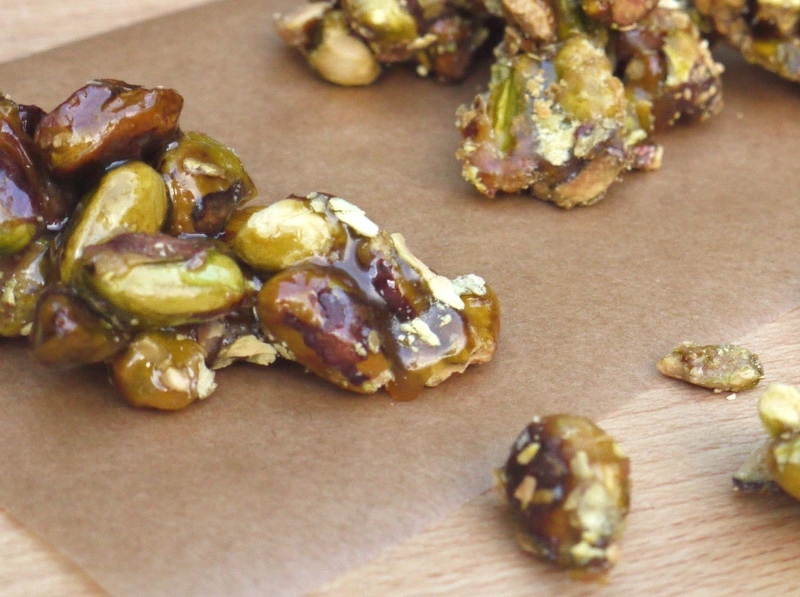 You had me at honeyed pistachios! I’ve been raiding the icecream supplies and loving all this sunny weekend weather we’ve been having. Lovely! 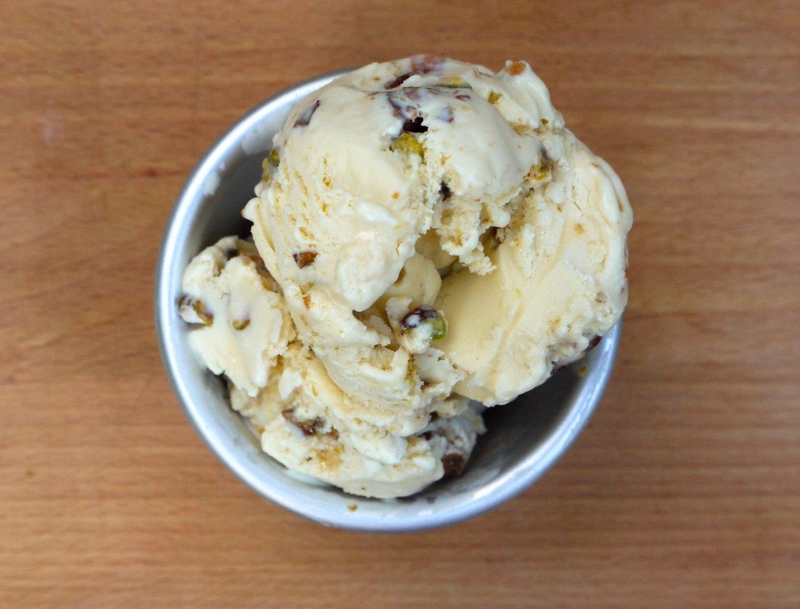 Honey & pistachio are such a wonderful combination and this ice cream would definitely make me forget about the coming winter! I’m like you. I love the anticipation of so many things. My favorite probably being the one where I go In search of the next perfect holiday destination! I do love autumn though, as much as I love summer… This ice cream would definitely work for me in any seasons with some of my favorite flavors! I totally believe ice cream is a must all year round… which is also one of the reasons I could justify splurging on an ice cream machine. oh, and don’t get me started on anticipation! Sukaina – I put pistachios on so many things… Didn’t know it was a sign you were pregnant!! Shuhan – it’s actually been quite bright the last few days, fingers crossed for a nice sunny September! Jaime – thank you. And thanks for the wedding wishes…so so so excited! Simone – holiday planning is the best! 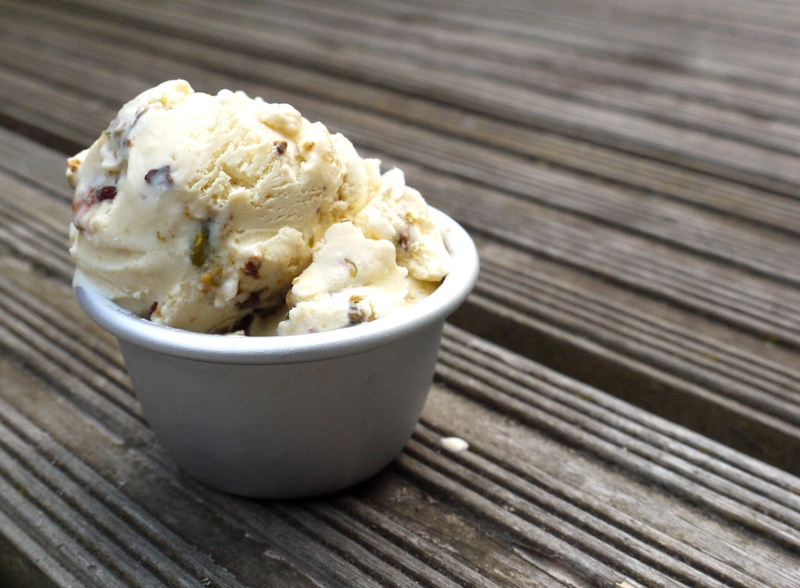 Nuts About Food – I’m so glad I invested in an ice cream machine – it makes all the difference! This looks so incredible! I want to stick my face in it.